I am back to SNC challenges. Sorry friends.. As I told earlier in my post, due to some personal reasons I could not come to the blogging world. 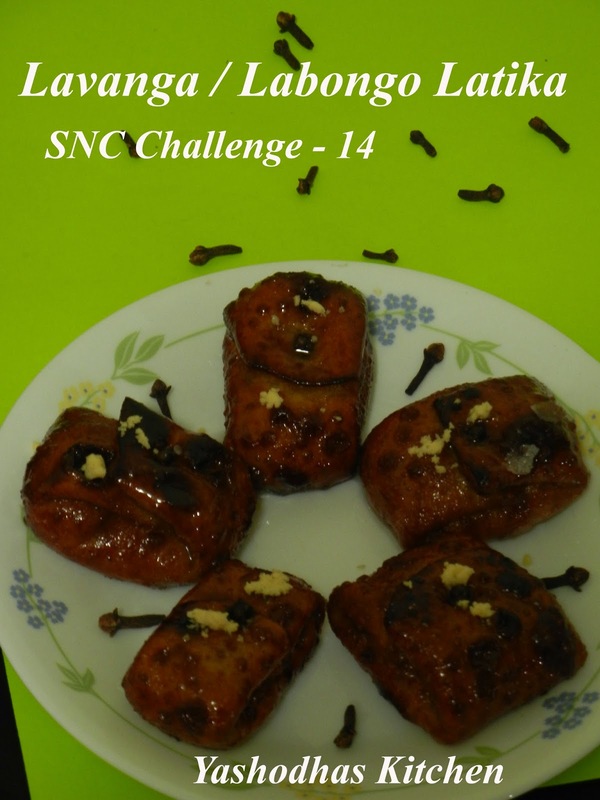 So I really missed this wonderful event SNC challenges. From this month, I will try to do all the challenges and also try to do the missed out challenges too. 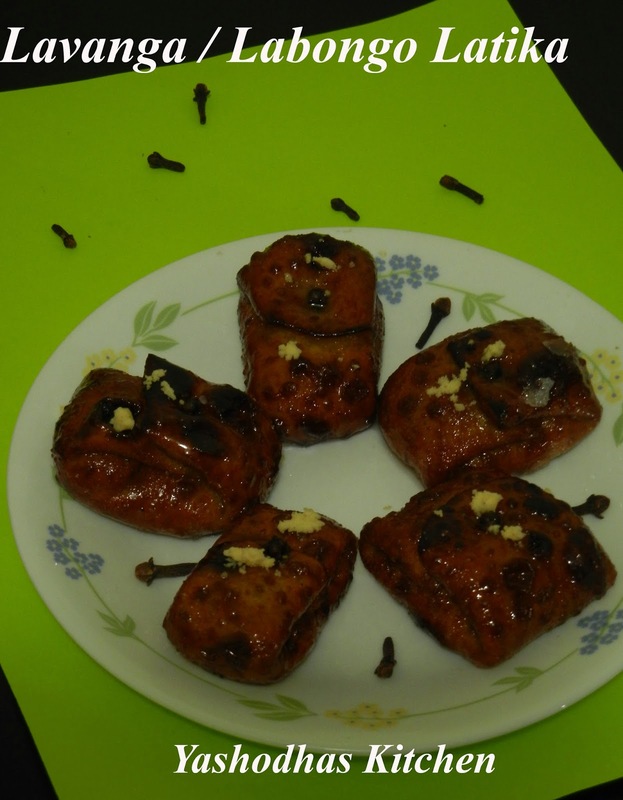 Though Divy (our baby boss) already gave chances to all of us to do the missed out recipes, I could not do them on that time. But some of our friends done a very good job by posting the missed out recipes. Sorry for not commenting on your spaces too. I will try to visit all your space for sure. We all know that SNC is the event conducted by Divya pramil from youtoocancook. She successfully completed the first anniversary of the SNC two months ago. I am really happy for this brilliant event and wish her to get more and more success. I am very proud to be a member of this event. Thank you Divy for this awesome idea to learn recipes and get to know different people in this blogging world. To learn the regional recipes, Divya cleverly introduced this SNC event. The members of this group is divided into two groups. One is North team and another is the south team. The members are grouped according to their origin. 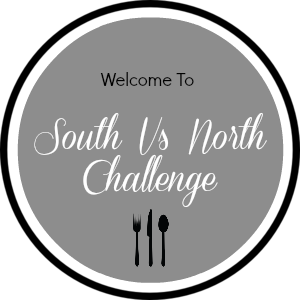 Every month one member from each of the team will challenge the opponent team with their regional recipes. IF you want to know more about SNC, please click on the below image. 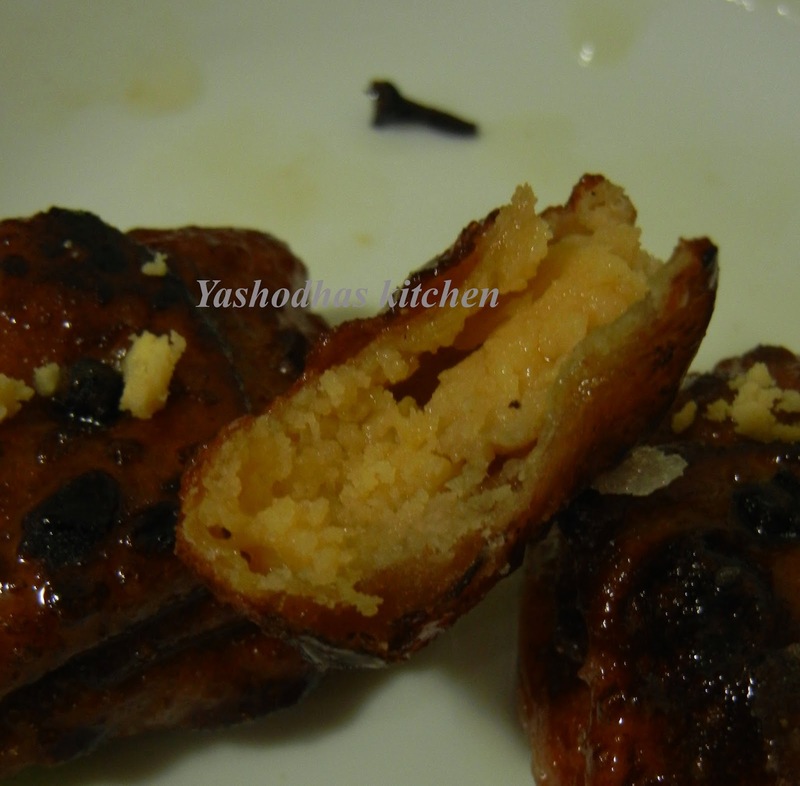 This month Sanoli from Sanoli's kitchen challenged this awesome bangali sweet Lavanga Latika for us. Shama Nagarajan from easy to cook recipes challenged with our traditional sweet Surul boli for the the North team members. I am a member of the southern team. wheat flour, instead of all purpose flour. All purpose flour is not good for health. instant home made khoya instead of dry khoya. Originally, they use ghee for deep frying. But I used oil for deep frying. I kept the oil in high heat. So its color came darker but its taste is good. I would like to tell you one truth. All purpose flour is always gives the rich taste, but it is not good for health. 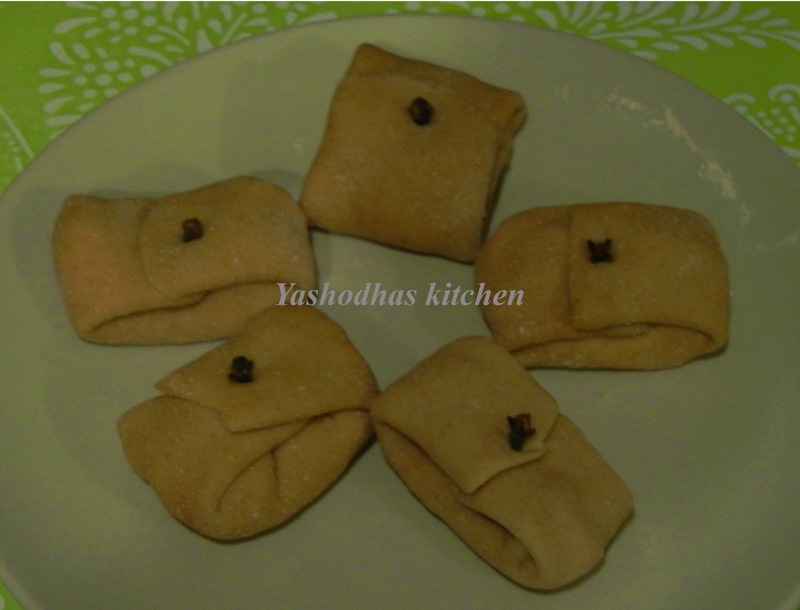 Wheat flour is very good for health but tastes is not as rich as the all purpose flour. Add the crushed moist khoya, cashews and almonds in a bowl. Mix well. Then divide them into five parts and keep it aside for filling. Add sugar and water in a pan, Mix well and heat that in a medium flame. Once it started boiling, add cardamom powder and switch off the flame once it gets one string consistency. Mix all the ingredients under the outer crust heading. Make a soft dough. 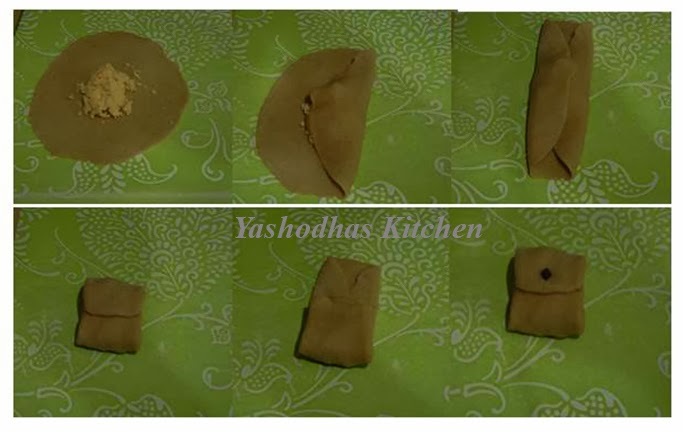 Divide the dough into 5 equal sized parts. How to make Lavanga Latika with all together? Take one ball of the dough, dip both the sides with wheat flour and start rolling it using the rolling pin to make a thin round. Keep one part of the filling in the middle of the round, fold it like envelope and seal the middle point with clove. See the below pictures for the clear understanding. Do the rest of the dough balls and fillings as same as the above procedure. Remove them from the oil and pour them into the sugar syrup. Allow them to stand in the sugar syrup for 1 or 2 mins. Then take them out and keep them in the plate or air tight box. It is very yummy and thanks to sanoli for giving us to cook this delicious recipe and enjoy to the core. Your wheat flour labongo latika is truely delicious. Well made Yasho. Hope you like this sweet.